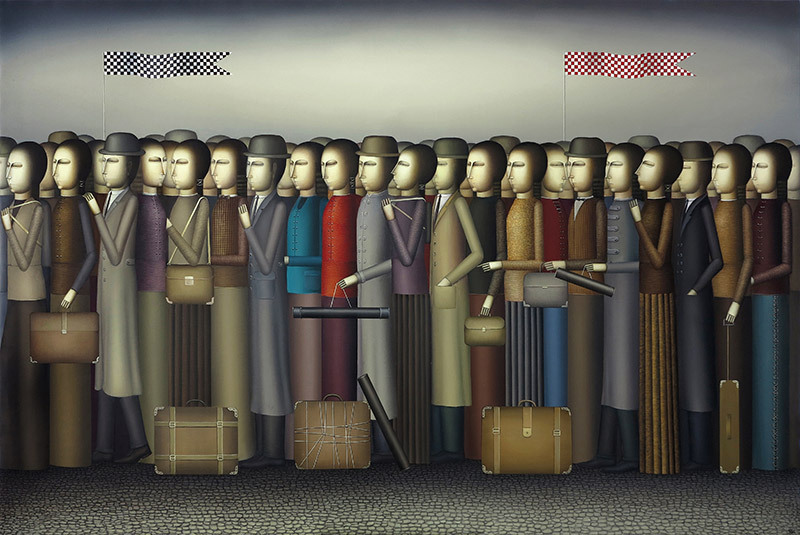 The works are displayed at Modern Art Museum of Armenia, Bel-Air Fine Art Gallery (Genève, Switzerland), Arame Art Gallery (Yerevan, Armenia), Vinizki Gallery (Munich, Germany), Europe Gallery (Palo Alto, California, USA) and in private collections in USA, Germany, Switzerland, Lebanon, France, Turkey. 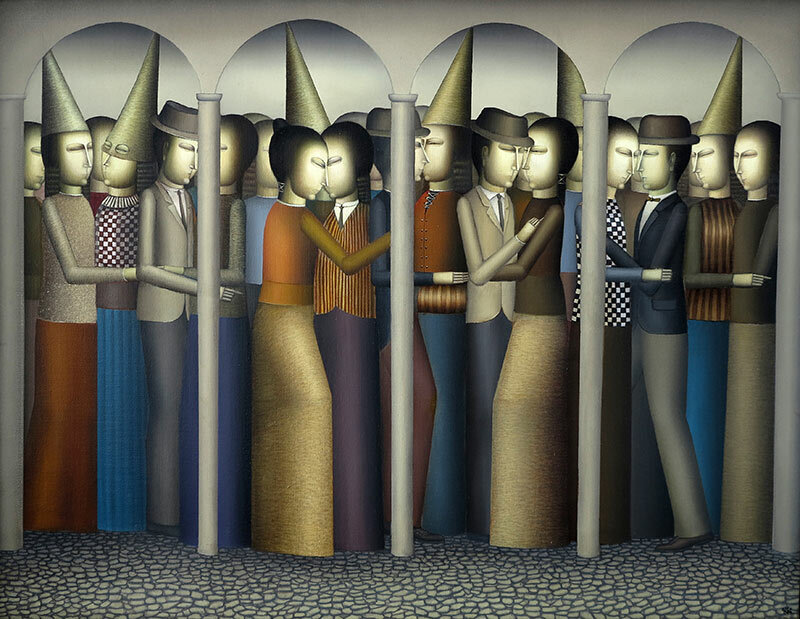 What attracts one’s attention at first sight is that the paintings of Armen Gevorkian reflect an individuality that is impossible to attain. It seems that everything has already been done, seen and experienced in figurative art and it becomes difficult to avoid the fate of becoming some appendage of famous analogues. 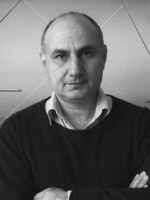 But Armen is an artist who could never accept the role of being a satellite, which we feel from both his unusual, exceptional handwriting and irrational way of thinking. Devoid of daylight in his boxlike studio, completely isolated from outward life, Armen travels with his personages, moving from one painting to another. He changes the surroundings and situations, never leaving this rather strange, nonexistent, organic and native state, and never wishing to emigrate. The neatness and order he has established here are worthy of respect; there is no spontaneity, nothing from Bohemian chaos or artistic disorder, but at the same time not a bit of mathematical coldness. 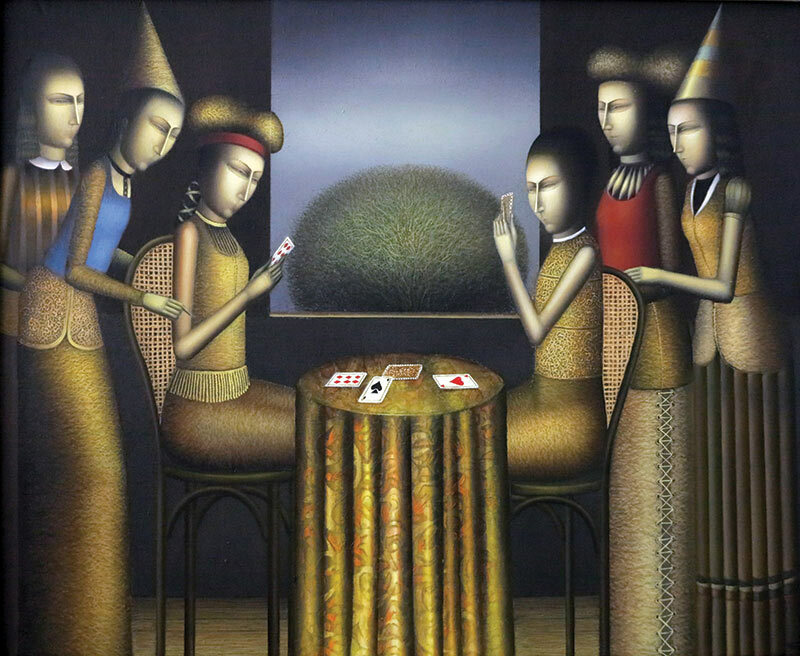 Armen is one of those artists who breaks the mold of stereotypical, multicolored, Armenian painting. However, in spite of restrained coloring, his paintings do not contain tragic or dramatic elements – they are calm and contemplative. There are several themes repeatedly attracting the artist’s attention and creative energy: Horsewoman, Combat, Butterfly Hunters, Games, Shooting Range, and others; but one can never find mechanical reiteration in these paintings. Each time he shares new experiences, new sensations with his characters; he lets them ripen and then perfects and enriches his creations. The outline of his plot in these unique one act performances is concentrated on the focal point. These laconic, apparently theatrical stories are just games of a grown-up – neither infantile, nor naive. They are mediations of a kind dramatist who prefers to see conflicts only on stage. 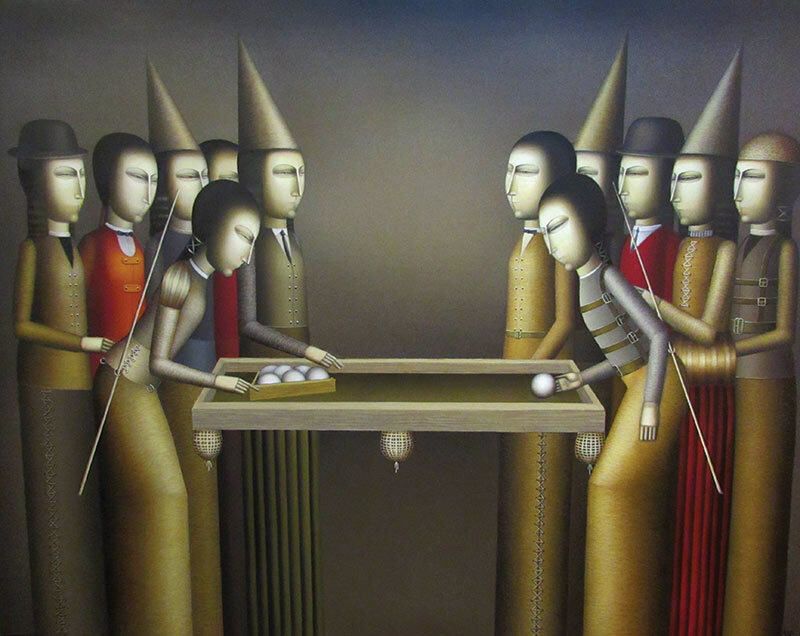 The gaming table often becomes a battlefield where the roll of the dice, draw of a card or stroke of a billiard cue determines the outcome of the contest. The contests of Gevorkian are not bloody combats; they illustrate the eternal opposition which we all encounter in a myriad of disguises every day. The egg often appears as a symbol of something valuable. Armen uses the egg as the prize for the victor of the battle, just as we fight the contests of life for symbols of wealth and status. 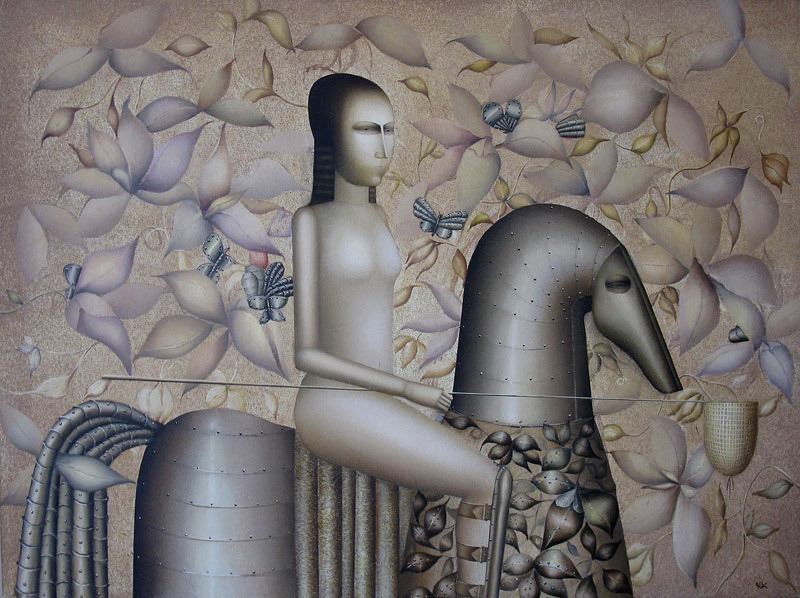 The accessories that the artist operates with often include: women, eggs, games, metallic looking horses, pointed caps, flowers, easels – all of these objects make up the strange and extraordinary world of Armen Gevorkian. His pictures – are the windows into the world of small dynamics, slow movements, but not of cool passion at all. The air is clear, but it is fresh and chilly. Landscapes seem to be from “The Martian Chronicles”. Personages are elegant and full of inner dignity. And always preoccupied, in each situation – life is a hard and an intricate thing. Billiard – is a symbol of temporal and spatial extent of life. The billiard field is as green as the land. And here on this green field we see the action. The everlasting heat of the toy battle has provoked it. And in this artificial world of restraint and cataclysms are scattered vessels with life – eggs, to keep hope that the most perfect, the most alive life will hatch out.